The Empire of Brittania has invaded Japan using giant robot weapons called Knightmare Frames. Japan is now referred to as Area 11, and its people the 11s. A Brittanian who was living in Japan at the time, Lelouch, vowed to his Japanese friend Suzaku that he'd destroy Brittania. Years later, Lelouch is in high school, but regularly skips out of school to go play chess and gamble on himself. One day, he stumbles on terrorists 11s who've stolen a military secret and is caught by a member of the Brittanian task force sent after them, who is Suzaku. 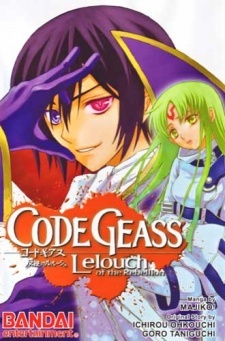 As the rest of the squad arrives, Suzaku is shot for disobeying orders, while the military secret, a young girl, gives Lelouch the power to make anyone obey any order. He takes command of the terrorists and leads them to crush the approaching Brittanian force. However, Suzaku is secretly made the pilot of Brittania's brand new test model Knightmare, Lancelot. Lelouch becomes the masked king Zero to lead the rebellion to defeat Brittania.